Top image: H.G. 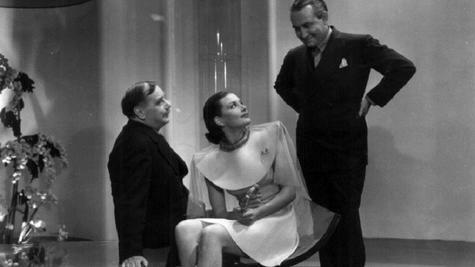 Wells, star Pearl Argyle, and director William Cameron Menzies, on set. 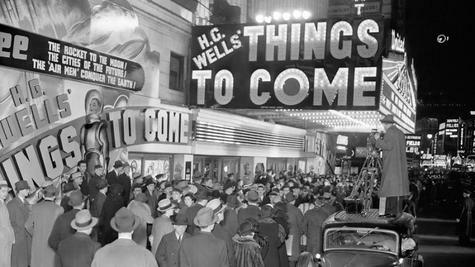 Wells wrote the screenplay of Things to Come, based on two of his books, Things to Come and The Work, Wealth and Happiness of Mankind. His original title was Wither Mankind?, which isn't quite as catchy. A big reason for Wells to want to make his own movie? He hated the vision of the future in Metropolis, which was full of "balderdash" about "'robot workers' and 'ultra-skyscrapers.'" He told the filmmakers that "whatever Lang did in Metropolis is the exact contrary of what we want done here . . . There we have the guiding rules to observe. But within these limitations and style I would say to our designers, for God’s sake, let yourself go!" Wells had a huge amount of sway over the film, thanks to his huge literary fame — but he didn't succeed in his crusade to eliminate all credits from the movie. (He wanted the information about who made the film to be available only in the form of booklets, handed out at theaters.) Meanwhile, actor Ernest Theisinger shot all his scenes as the artist Theotocopulos, before Wells decided to replace him with a new actor, Cedric Hardwicke. Theisinger showed up at the film's premiere expecting to see himself in the movie. Also, Things to Come was one of the first science fiction movies to have a super-successful soundtrack release — Arthur Bliss' score was released on three 78-RPM records, and he performed it at hundreds of concerts. And because people believed that Things to Come had predicted World War II and the Blitz, it had a huge re-release in 1940. Charlie Jane Anders was a founding editor of io9. She's the author of the bestselling All The Birds in the Sky, the story of a witch and a mad scientist who grow up together and maybe find love.